!!!!!! Thank you everyone !!!!!! !!!!!! I close the comment !!!!!! I'm always happy with your comments, so I decided to do a giveaway here. It's the first time for me. In Japan, some people do this as "Kawa-pre". "Kawa" is from kawaii, means cute, and "Pre" is from present. I got a Japanese craft book of Sashiko stitching. I also made an item from the book (* v *). I also got a Japanese craft book of Felt mascot. I also made an item form the book, but with not felt... I don't have any felt fabrics. (* v *)!!! I make a pack of some of my favorite Japanese cotton fabrics. They are from the pictures(I'm sorry, not them all, in smaller pieces) and others from my stocks. I also put something additional on them. I make three of this fabric bundle. So I can send five items for five persons. To enter this giveaway, please leave a comment here, till 6 am of 22th July(EST). Please write which one you want. If I cannot contact you, I'll pick other person again. Thank you very much for cheering me up always! This is a such a generous giveaway! I'll love all the beautiful things you make Mai. I hope I win so I can make beautiful things like you too!! I enjoy to read about your crafting and life in Japan. Seeing your creations cheers me up too. thanks. I would love to win giveaway 1 as I have been interested in sashiko a bit lately and tried a few basic projects. I really hope your giveaway goes well! I would love to be the happy new owner of your felt pets book. Thank you and happy blogging! If I must choose the fabric would be fab! I would love to have that Sashiko book in my hand either! I already have a German one but it´s so small...I would love to get more inspiration! thank you for shering. i dont comment usually but read your blog from day 1. i would love to win the fabrics. oh you sweet hand stitching giveaway girl! I love all of your lovely gifts and I think if I had to choose the book and pack one would inspire me to try your lovely hand stitching - i have had a go - and enjoyed the little bit I have done, but I'm not sure I have your patience - but thank you for your blog - it makes me smile! Sugoi! Thank you for such a generous giveaway! I love the felt animals book - it would be a pleasure to win it! I love your blog - your sewing is amazing. Hi I have been reading your blog regularly since I stumbled across it this year. I am amazed at how you sew everything by hand. Please put me in the draw for the Sashiko stitching book. Thanks! I really love all your handmade items mostly the sarubobo. They are so cute! I also love to read about your life in Japan.So I choose the giveaway number 2.Thank you so much! I'd love the felt book since I just ordered a whole load of felt from another Etsy seller. I love all the cute things you make. I wish that you had a sarubo in your giveaway because that is what I really want! But if not that, then I'd love to get some fabric and try to make them myself. Thank you. Such a lovely idea! I recently found your blog and I absolutely adore your work - especially the sarubobos have inspired me! I'd like to learn to do sashiko embroidery so I'd like to join the draw for giveaway 1, please. Lovely summer for you! What a nice thing to do! The fabric is my favorite, it's gorgeous! Sorry I've never commented before, but your blog is a huge inspiration to me - I have to be away from my sewing machine right now, and I'm always amazed by what you do with hand-sewing alone. Thank you for this chance and for writing your blog in the first place!! thanks for this lovely idea. I follow you blog since the day I found it an I love it very much, especially your way of eyplaining things. I would love to receive a giveaway - either one as they are all very nice. So I will make a try. I just love reading your blog. Your work is amazing!! I pick giveaway 1. The Japanese craft books are certainly rare here in Canada so if I would win I would pick one of them! Mai you are so very generous, i have been lurking on this blog almost daily since i stumbled on it and it is bad that it takes a giveaway to make me comment! i love your work and have made a button pouch and sarubobo galore, like you i hand sew everything as i don't have a sewing machine, finding your blog has been a real inspiration. i equally love all the posts about japanese food which is a real favourite in our house. i would love any of your givaways but maybe the sashiko the most. That is a lovely thing for you to do! It's so difficult to choose, but I pick the fabric bundles, because the fabrics (and also what you do with them! )are so beautiful. Thank you!! Thank you for giving us the opportunity to be part of your generous giveaway. I think you are the most cleverest girl. Your Blog is a delight and pleasure to read. I just love those little sarubobos that you make. Thank you for all the little tutes you give along the way. Oh - what a star you are! Kawaii always brings back such good memories as when we travelled in Japan my boy was always described that way! I love either 2 or 3 - too hard to choose! You deserve all the glorious comments! You make such adorable items ^^ it would be nice to learn the stitching in the first book. Send my love to Bo-Chan! Thank you Mai for being so generous! I love your blog and you really gave me a new love for hand sewing. I have started to do it again as well. I can hardly choose between your wonderful gifts, but I would love gift 1 or a fabric bundle the most! Your blog is adorable. I'd love the fabrics! Thanks for organising this giveaway! I love your blog & I would love to enter for the giveaway no.2. I can't resist cute felt plushies! It's a tough decision as I love the floral fabrics as well! What a generous giveaway! I really love your blog, and your projects are so beautiful and inspiring :) I think that I like giveaway 1 the best, I love sashiko stitching. I always read your blog and follow your tutorials. I'm from Italy and it's nice to see pictures of your life in Japan. Thank you for such a generous giveaway. I have been reading your blog for a month or so now, after being introduced to your blog from another crafty blog. They talked about your wonderful hand stitching. My choice would be the fabrics. I love your sarubobo, and I love that you make everything by hand. Hi!!! I'd love to enter your giveaway!!! I'd love #1, it's the one I like the best!!! I love it all to be honest! give away! Sugoi tanoshi! Arigato! I'm just learning about sashiko and trying out some designs from library books – would love to have a book of my own. You've given me inspiration for some projects. I am regular reader of your blog and in fact, I have a link to your blog from mine! I love all your creative works. You are simply superb! hi mairuru, i like very much what you does ... simplicity, beauty, and i learn more about japenese culture reading your blog. thanks. Oh, wow, such a great giveaway. You're very generous, and you've chosen wonderful things, as always. I like Giveaway 1 the most, am very interested in the stitching. I think my second choice would be some of the beautiful fabrics. Thanks for always being so inspiring! I would prefer giveaway 3 because I definitely need some new fabric and Japanese fabric is the best! The sarubobo that you make are so darling. I look forward to seeing more. What a lovely giveaway. I've really been enjoying reading your blog. I love seeing the things you make. Thank you for hosting such a generous giveaway. I would love to win the fabric. I love that you sew everything by hand. You are very inspiring to me. I pick the fabrics as I am a sewer also. I would use the fabric to make a present for a good friend. I love your creations! I would love any of the bundles - lovely things!!! What a fabulous giveaway! I absolutely love Shashiko stitching so Giveaway 1 is definitely my choice! All of these options are really lovely, so just put me down for whatever is least popular (that way I'll have better odds!). Thanks for being so generous! Thank you very much for all your comments! I'm happy so many people coming here. I want to know who left the comment of Annonymous, the last line, "Namaste". I'll put the name as "Namaste", but if you read this comment, please write me your name and e-mail, to maimairuru(at)gmail(dot)com. You are so super sweet to have a giveaway! I love all of your prizes but especially number 1! what a nice offer! if i win, i would like a fabric sample please. i like reading about Japan in your blog, and really like the sweet items you handstitch for your shop. so fine! my parents are Japanese, but raised us kids in the US. i am attracted to Japanese-style handmade, and love to knit, crochet + sew myself. nice to meet you! ps - the code for leaving a comment is "creade" almost "create" - isn't that a nice coincidence? Ooh fab give away! i struggle to choose which i like best between 1 and 2, but think I like 1 best because I've not seen anything like it before. I stumbled across your blog a few days ago and have got hooked on it, I've been reading it at work among my piles of paper-work. It is an oasis of beauty and calm in my work day. I adore your hand crafts and you have inspired me to try hand stitching for myself. I would feel lucky to receive any of your givaways, you are so generous! Here, in Brazil, many people makes a giveaway on the blog's anniversary! I would love to win giveaway 3!!! Thanks for the opportunity and good luck to all! Hello Mai! I would absolutely love to have the Japanese fabrics! I live in the U.S. and it's hard for me to find those fabrics, but I want them very much because I make stuffed animals and other crafts. My grandmother is from Japan and I would love to make something for her with those fabrics :) You are so nice and kind! I love seeing all the things you make especially because you stitch by hand. That is how I like to sew things too! Your giveaway is very generous. All the prizes are so nice, but I always wanted to try sashiko. I've only just found your blog but it looks lovely and I'm going to read more of it. I teach Japanese crafts in the UK so it is great to hear about people like you! I also like to teach my daughter because she is starting to sew and make things now. We use old kimono fabrics to make things. I can't choose which item I'd like to win because they are all gorgeous, so if I am lucky enough to win I would be happy with any of them! Hello! I just found your blog about a week ago and am so taken with your beautiful work! It is truly an inspiration! I suppose I will sign on for the fabric as I love the tiny prints and never seem to be able to choose them myself! Thank you for always posting great articles on your beautiful projects! You inspire me and I am a huge fan! I love your work and hope to win something - anything. If not this time, it's ok. I leave it to you. I love all the items but I have had the hardest time finding sashiko information, so please put me down for giveaway 1. This is really three giveaways - very generous! Thank you! I found your blog when you posted your patchwork pouch tutorial - I haven't made it yet but it's lovely. i love your style and the tutorials you've given! thank you! i would really like to win giveaway 1 because i like embroidery and i've been wanting to try out sashiko on my projects. What a lovely giveaway, thank you so much for your generosity! I would love to participate in giveaway 2, I like to make felt softies and the book looks great. Hi, Mai! It's very kind of you to have this giveaway! I would love to get some pretty fabrics to make more sarubobos and purses! This is a wonderful giveaway, all of them are great! The felt mascot book is my favorite. Here's hoping! Thanks for a great giveaway!! I think I'll sign in for one of the fabric bundles. Always yearning for fabric!!! I hope you keep on with your blog for a long long time. We blog readers are always so selfish!! I enjoy your work and your tutorials are awesome, so I hope you're not thinking about retiring anytime soon! Hi. I'm Carmen from Canada. I absolutely love your blog - it is so sweet and inspiring. I would love to win the fabric bundle I think, but anything would be great. I love the beautiful things that you make too - they never fail to make me smile! Japanese craft book of Sashiko stitching is my pick. I just love to read your blog. You are so creative! Excellent! thank you for having a give away! I hope you are successful! I would love the sashiko book! This is very exciting - you are talented AND generous! What a beautiful giveaway! I would pick giveaway 2! Thank you Mai! I would choose the sweet fabric first but all the prizes are lovely. I have a question too. When you used cotton instead of the felt, did you simply turn under the cut edge of the fabric and then topstitch the two pieces together? Did you use an embroidery stitch alone or did you do a running stitch first and then disguise it? Hard for me to tell from the picture. I don't like to work with felt and (duh!) never thought to substitute with cotton. So thanks for the inspiration, too! You give me such wonderful ideas, thanks for the give away. I love the sashiko craft book. This is a wonderful give away! I would like to win a fabric bundle or the sashiko book. I thove them all so much, but the first one is my favorite. Thank you! hello, I'd love to have the 1) zakka book or the 2) felt mascots or the 3) any of the fabric! Love it all. You make such cute things! All of the items are so cute. I wish I could win Bo-chan ;-) but I do like the fabrics. Thanks so much. WOW Mairuru!!! you're so generous!!! I love all the stuff you giveaway!!! but I think I'll be in love with some of your fabric. My choice is 3! How great! I would LOVE a fabric bundle! I'd like to enter #3, please! Thank you for sharing your fabrics and books. It's so great! I do lots hand embroidery. I love to win the first give away.. cross fingers..
Hi! Your blog is really fun to read. :) I think it's very inspiring that you even hand-sew your own clothes! I am planning on using your zippered pouch tutorial for a gift for a friend soon. I'd love to enter the giveaway for one fabric bundle. Thanks so much for all your lovely blog posts. Mai, how wonderful and generous is your giveaway. I was so excited when I clicked on your page today. My daughter and I love making animals with felt so the felt mascot book (giveaway2)is my pick. Thank you so much!. Mel. I would love to get #1, it would be great to learn some new stitches! I read you with great pleasure for a few weeks, and felt too shy to comment yet. I can't imagine one of your wapre items to be less popular, you choose so many cute things! Oo,Oo (raises hand) Pick me! Pick me! I love your blog, and get my Japanese inspired craft fix from you daily! I would LOVE number 1 please - I think Sachiko stiching is to die for! I really love your blog, it's been a really great source of inspiration for me. I love looking at your stuffs. It would be nice to win those lovely things. If I do, I would like #1 or the last fabric group that I think are so beautiful. Thank you for giving us the opportunity to win. I love your work and your work. I an hoping that you are able to visit LA someday that i will be able to show you around. The you for doing the give away. Please count me in for # 3. Thank you. ooooh, such a wonderful giveaway! I love them all so much. If I had to pick I'd go with- giveaway 1. I really adore your blog. Such beautiful and thoughtful posts. I love your blog. I even read your posts not just drool over the pictures because they are so happy. I would love to get any one of your giveaways but I love felt mascots the best. I have been following your blog for a while now and am amazed at how you make everything by hand, you need to be congratulated on your work, If I was to win, I think I would like one of the fabric packs. I would use it for my 2" hexagon quilts. i just found your blog & i'm so glad i did! i'll throw my name in the hat for the sashiko book (if you can ship to US). Dear Mairuru, the things that you make are very beautiful and they are great inspiration for what I do. I think I actualy owe you. I should send you something in return. This is such a lovely idea. 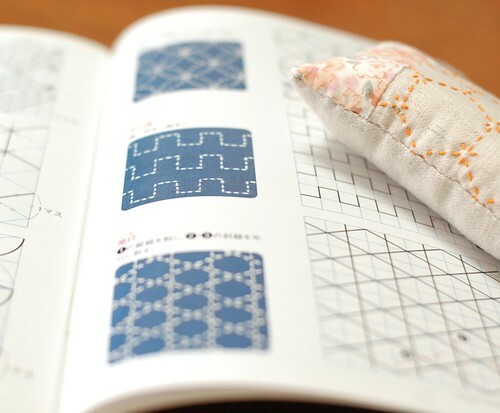 I really love the look of the sashiko embroidery book, so I think that would be my choice. I would have a hard time choosing between that and the fabrics =) You have a beautiful site, and have been a big inspiration to me. Ouch, I forgot to say that I would like the sashiko book the most. The bundle of japanese fabric please! Oooh! All the choices are so good! I think Giveaway #1 is my favourite though. I love to sew, and the projects you do are totally cute. 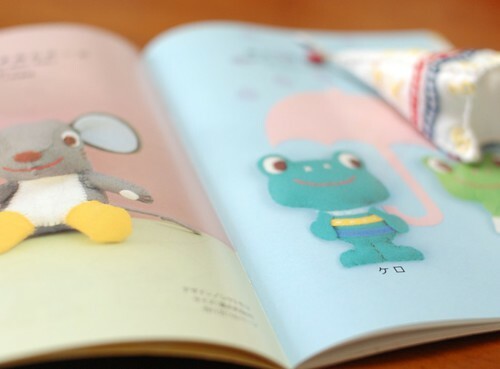 Having a Japanese craft book would be wonderful! 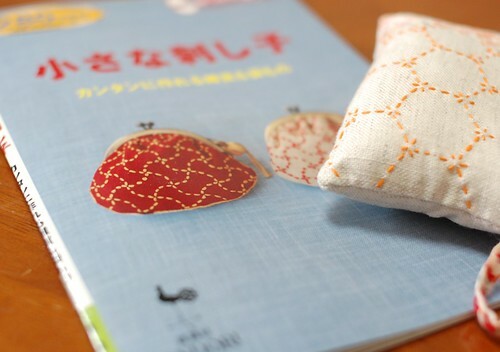 I love your blog and the idea of "Cute presents" The sashiko book would be great to have. I just love those Japanese craft books. It is so fun to give something to your readers, so both the giver and receivers are happy. I love your blog and sended the link to my daughter-in-law too and she loves it too. Wish you much fun with the comments and I would love to win the Sashiko book. Thank you for this chance to win super kawaii crafts! This is such a sweet idea. 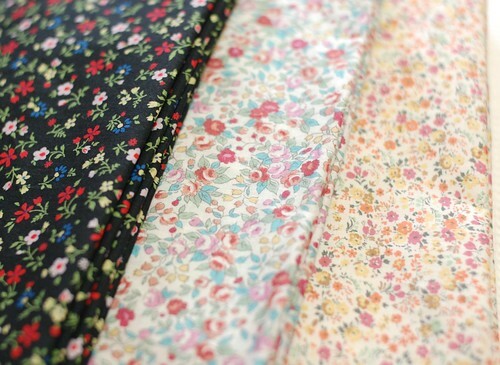 I look forward to your blog every day and would love to be picked for a fabric bundle. Thank you and best wishes! you make so beautiful things with your tiny hand stitch....it really amazes me what you do without any sewing machine. keep it up. if i win .....just pick any of your five wonderful prizes. Hello Mai! Thank you so much for this wonderful giveaway - you're so very generous. I love your posts and find them to be so inspiring. I honestly don't know what to pick because I think they are all so wonderful - I like the books, but can't chose between them. weee!! this is a great way to find out who loves your blog and never leave comments hahaha! Wow Mai you have alot of people responding. I rrally like the first one but would be thrilled if I got anything at all. Count me in! i enjoy visiting your blog. The little dolls are adorable. 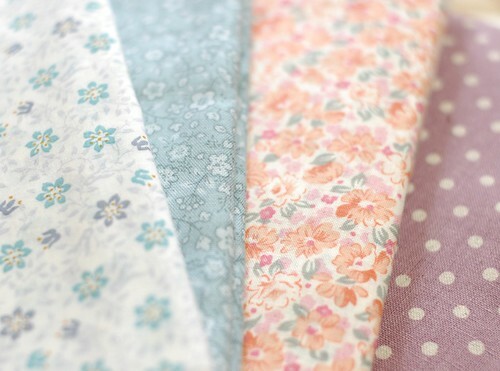 If I win, I would choose giveaway #5- the group of pastel fabrics. Thanks so much! Hi! I have been following your blog for just a few short months. I wish I would have found it sooner! I really enjoy your posts & your handmade treasures. They are a great inspiration to me. I am from the United States, Louisiana to be exact, so I love to see your food and other Japanese things. I am a great fan of sushi, but I am sure that the U.S. sushi does not come close to what you can get. Please put me in for the Sashiko stitching book. Many thanks & take care! thanks for sharing - you're not just super crafty, you're generous too! ooh, a chance to win some of your wonderful fabrics! i would love choice #3 if i am lucky enough to be selected. thanks for the contest and your lovely blog. I love your blog! I have made your sarubobo and it turned out so cute! What a wonderfu giveaway you are having! 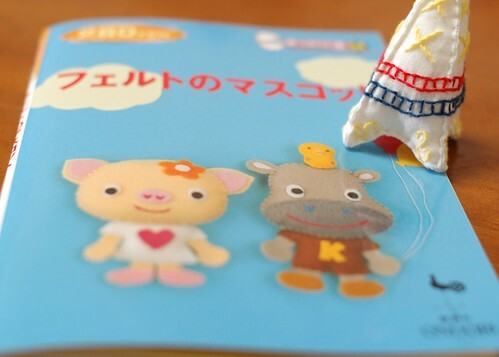 I love the little felt mascots book! You're fabric is lovely too! I would have to pick the book though! I love your blog & have been admiring it from afar. Thank you for the wonderful giveaway & your generosity. I'd like to pick giveaway #3 please. Thank you! hola mairuru! I'm a fan of your handstitching! your crafts are really cute and your blog is super informative too. I woul love to win the fekt mascot book. Hi Mai! I really love your taste in fabric! You always pick the cutest! So I'm in for any bundle of fabric! Love your blog. I check it every day for undates. Everything you make is divine and very inspirational. If I win, I would love giveaway 1. Thanks for your generosity and for sharing so much with us. I love to read your blog ! I like the fabrics. I have the Sashiko book and love it. For your question, I'll answer later. Because I don't want to show you the details of giveaway, so I cannot explain now. When I finish sending giveaway items, I'll post here more details of them. Your idea about a giveaway is very very generous. All gifts are very nice :) I would like number 3. I really love your blog . And I choose the giveaway number 3.Thank you so much! i often read your blog and your outcome inspires me very much (i even linked you on my blog). i tried some basic sashiko stitching myself, so i'm in for giveaway 1. thank you for sharing with us. You do such lovely work. I appreciate your generosity with your tutorials and now with such a great giveaway! I'd love to win the fabric, or the fabulous book in giveaway 1. Oh I love that fabric!!! So many darling things I could create with it!! Hi Mai! I discovered your blog a few weeks ago and your work is so inspiring that I've started hand sewing again. Thank you for sharing with us. If I were lucky enough to win your giveaway, I would choose the Sashiko book. Thanks for a chance to win! Hi Mairuru, I love your blog and have become addicted to making the little patchworked pouches from your tutorial. I'd love to win Giveaway 1 because I'd love to try the techniques on my little pouches. I LOVE the Japanese fabrics. They remind me of when I lived there! Here's my email address just in case clicking on my name doesn't work. you are an inspiration and you make such lovely things. i learned how to do sarubobo dolls and i love them. hope i will be one the lucky ones, my favorite is the book for felt mascots. I would be thrilled to win any of the prizes, but the felt mascot book is my favorite! I would love to win the sashiko book. I enjoy reading your blog and tutorials. You are very talented and generous. Please keep up with the inspirational craft posts. What a useful tutorial (covered hair clip) ! I just gave birth to baby girl, so I have been looking around to find a project that I could make for my daughter. Thanks for the giveaway too ! Hi!, I've following your blog since a while, but i'd never write.. sorry I'm bad writing in english because i'm from mexico, but i just love all your work, you inspire me, the giveaway 2 is lovely, it will be fantastic to win, but no matter that your blog is my favourite over all, well from now i'll start writing you more commments, oh and thanks for all that amazing tutorials!! ちょうかわいい〜！They're all really cute, I wouldn't be able to decide....But it would be either of the craft books, they both look awesome. I LOVE your blog! And it is one I check everyday. Thank you for your sweet offer of a give away. While all items are very generous, number one would be my favorite. Thank you for inspiring me and so many others with your lovely work. You are very generous aswell in sharing your ideas as in arranging this give-away. Your blog is always a good place for inspiration! What a great giveaway from such a wonderful artist. I love your work. I'd love to work with some of that fabric, it's truly lovely. Wow. You are great. I would love any of the things you are giving away. I just found your blog and I love it! I would love to be entered to win giveaway #2, please! I also love the fabric bundles, too. I can't wait to see what else you will craft! I was looking at the adorable stuff you made at Siesta and couldn't believe I've never come across your blog before. I'm from Singapore and we have our little Japan here too. I make bags and buy Japanese print whenever I can get any. I love Japanese small craft and spend many hours squatting at Kinokuniya bookstore just browsing the book covers even though I don't know any Japanese. I just found your blog and I LOVE it! I'll enter for whatever is the least popular. I love them all! Thanks!! Been dreaming of japanese craft book and this is indeed a fab chance :) Would like to win the felt book! Last week I came across your blog when I googled for "How to make a Sarubobo", and I've been coming back to read your posts since. Great inspiration to me! I'd like to enrol myself in this giveaway. I would like giveaway #1. I love your blog and have made a sarubobo pincushion like the one you made. Sadly, my daughters said it looked like a snail! I'd love to have another go, so a fabric bundle would be perfect. Hello! What a wonderful blog you have! I would be delighted to win the fabric. What a generous person you are! This is my very first day visiting your site, and I'm in love with it! I linked from your fabric hair clip tutorial. I love the japanese stitching book. I might have to do some online searching if I don't win the giveaway! I love the fabric. You can never have enough. The tutorial on the fabric covered hair clips got my attention, great idea!!!! These are lovely!! I hope to win giveaway 1!! I would love a fabric bundle! How lovely to find you even without the generous offer of a bundle. Whether I win or I don't win, I can tell you about felting. There is needle felting and the easier cloth felting. Yes, it is easier than you think! It is also fun. First, go find a sheep...LOL. I would like the Japanese fabrics! The fabric! I love Japanese fabrics. Wow, I have only just found your blog, i love all your work and it shows how much you love doing it! You have inspired me to hand stitch on the things i make, thankyou! I would like giveaway 3 if i win as i love the fabrics. thanks again for the inspiration! You are so talented. I have only just found your blog. Please count me in on the fabric giveaway. Thankyou for being generous! been frequent reader since saw the making of sarubobo. It's lovely. would like to have the book to be part of my library. Hi, I have just found your blog two days ago, your work is really inspiring! The japanese fabric is my pick, because I asked japanese fabrics to my coming birthday. Oh I love all 3, and I love your work!! So hard to choose, ok 1st giveaway please, I've always wanted to do proper sashiko. Thank you. I would love to win the Giveaway #1, sashiko book. Thank you so much for coming up with this fun idea! I love giveaway 1. What a successful giveaway so far- lots of people! What a generous giveaway! I would love either of the sewing books. I enjoy reading your blog, thanks! How awesome! I love your blog and your creations! Oh, you are so sweet, and your blog is so kawaii!!!! I really do love it. I would love any of the prizes, but maybe the fabric is best! Domo arigato! Thank you everyone! I close it now!!!! !